It's finally Friday and boy, am I looking forward to the weekend. I've been racking my brain over my 'ten facts about me" list. I had no idea how hard it would be to come up with ten. But I promised, so here goes...ten things about me that you don't already know. 1. I hate peas, alway have since I was a little girl. I don't know why, but just the thought of them makes me queasy. 2. I love crafts of all kinds and actually have a separate blog dedicated to my crafting adventures. 3. My camera is a Nikon D90. I love it but freely admit that it is totally beyond my abilities as a photographer. 4. My dream is to leave my State job next year, (yes, I am a government worker) and pursue my love of all things domestic, becoming as self sufficient as possible along the way. 5. I have more designer paper and beautiful fabric than I will ever be able to use but I continue to buy it and hoard it. 6. I really don't like to paint walls...in fact, I really, really, really don't like to paint walls. 7. I have to choose to be content and not think the grass just might be greener in someone else's yard. 8. I would rather buy new garden plants than a new pair of shoes. 9. Our dog sleeps in the bed with us. In fact, he usually ends up between our two pillows. 10. One day I want to open a little shop on etsy. For those of you who noticed, you're right, that is a golf ball in my little white pitcher. It seems there is always something stashed in there, including trains, hot wheels and even a harmonica. Have a wonderful weekend. My sister's in town so I'll talk to you all on Sunday. 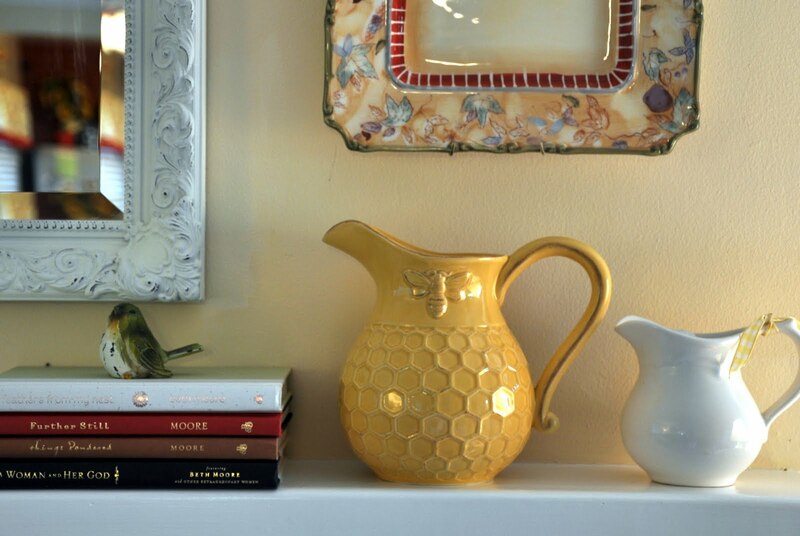 Love your yellow bee pitcher! So cute! Love your pitchers...all of them look so pretty! At least the golf ball matches. Have a blast with your sister. Hi Patty, I love the yellow bee pitcher and I hate to paint walls, too. Ha. I am looking at a new camera that is way beyond me. Yikes. I too hate to paint walls, but sure do love how it looks when they're all done! I love peas though...especially sugar snaps! 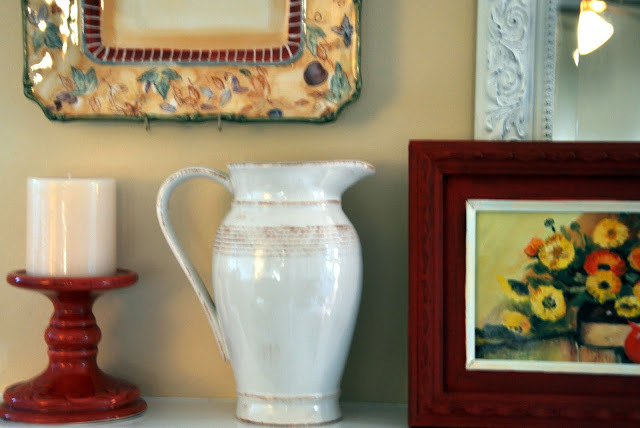 You have quite the eye for decorating, I do love that bee pitcher. I too love crafts and sewing. Anyone that is crafty has a stash of supplies but there is always room for more. I have fabric and if I sewed each day for a year I would not make a dent in it. I tried Etsy but you have to really get the word out if you have a shop. So mamy seller there that shops get lost. I remember when it first started out. The shoppers there love to see loads of pictures so your camera will come in handy for taking good photos. I have been looking at the Nikon but I think its over my head. May I ask about your crafting blog? I didn't see it on your profile and if it is even half as lovely as this one I'd sure like to take a peek! that yellow pitcher is darling, perfect for your lemon lane cottage. Hey, we have a WHOLE lot in common! 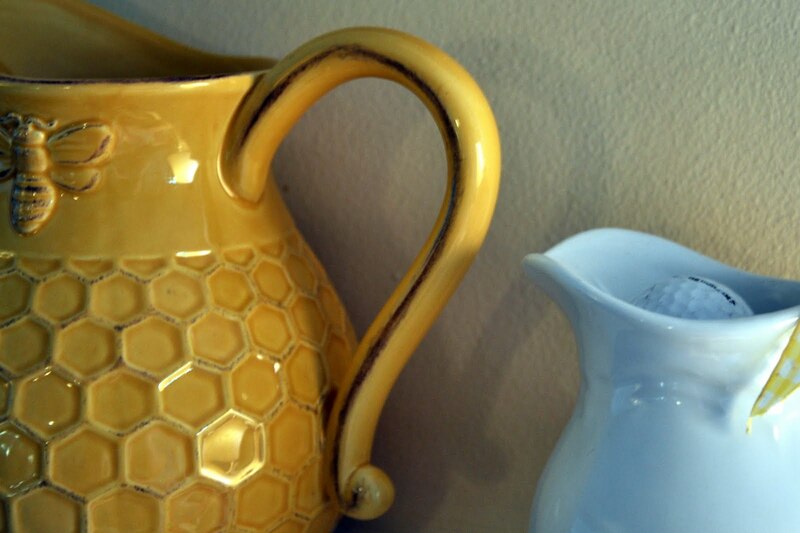 I love the bee pitcher! I would rather buy fabric or yarn rather than a new pair of shoes :) Have a fun weekend with your sister! separate blog dedicated to your crafting adventures. I know what you mean about craft supplies. I have some much yarn, fabric, and general craft stuff that I'll never use it all. Although I promised myself I'd stop buying, seems I'm always "needing" something now that I have a blog. Like you, I have a Nikon. Mine is a D60. I don't know how to use it either! Kind of odd to have a DSLR but to only take pictures in automatic. I really need to read the book I bought or to take a class. Would love to see your craft blog! I loved your list! I hate to paint walls and thankfully my husband hates for me to paint walls too! So it's a win win situation! Fun getting to know a little about you, and I too love that Bee pitcher. Have a great time with your sister. Oh this was fun...so many of them were me also...no on peas, will spend money on my house/yard before new clothes or shoes....Love your pitchers....go for that dream of etsy store...and what is your craft blog?